In my last post on homemade strawberry jam I mentioned that I enjoyed it with homemade bread. I have discussed homemade bread relatively frequently in the last couple of months, but I haven't actually posted a recipe, so I figured it was about time. My family eats a decent amount of homemade bread a week, and this is the recipe that seems to work the best and pleases everyone in the household. Combine the water, yeast and teaspoon of sugar in a bowl, set aside for approximately 5 minutes. To the yeast mixture add milk, butter, remaining sugar, salt and 4 cups of the flour. Turn onto a floured surface and add enough additional flour to make a soft dough (it shouldn't be overly sticky or too tough). Knead for approximately 8 minutes. Shape dough into a ball and place in a greased bowl, turning to grease top. Cover and let stand for an hour. Grease two 9" by 5" inch loaf pans. Punch down dough and roll into a 12" by 7" rectangle. Roll up dough from short side, making sure to seal ends and pinch seams. Cover pans and let rise for an hour. Bake in a preheated 400 degree oven for 30-35 minutes. Let cool completely before slicing. This recipe is one of the easiest I have tried. Even in my kitchen, where bread never wants to rise in the winter, this recipe turns out great. The best part is this bread is simple enough that someone who has never baked any type of bread, would be completely comfortable baking it. A great simple, homemade bread! Adapted from Good Housekeeping Home for the Holidays page 98. Looks great! I have a bread machine that I use off and on for bread. Homemade is so much better! Homemade bread is the best! My youngest was asked to do make homemade bread with live active yeast for science extra credit in the 7th grade - I had never made bread so I was excited about it - I found a simple recipe on line called Amish white bread - yummy - Your bread sounds good too - with butter - I will have to try it! Oh my goodness, I have to try this! I have always wanted to made homemade bread! I'm a new follower from the Monday Mingle. Would love for you to follow back! 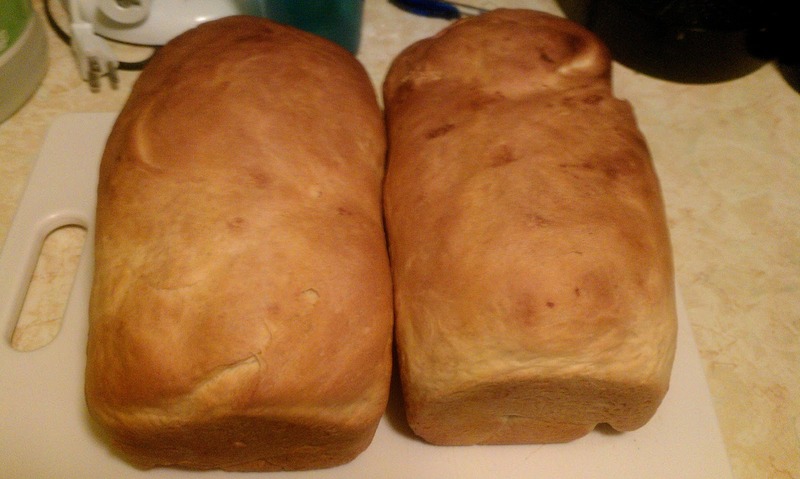 @Kelly I've made Amish bread a bunch, it's yummy and super easy! @Mary Homemade bread is actually very easy to make, you should try it! I love homemade bread...though I use fresh ground wheat when I make it. tastes so rich! Not a bad recipe though...maybe my husband will actually eat home made bread if I use this recipe...hmmm I'll have to try it! This looks great! I keep saying I am going to break my bread machine out and make my own bread, but I have yet to do so. @deaven The bread machine makes making bread super easy and it tastes delicious!